Yesterday morning I had a very humbling experience. I went to the meteorite lab on campus to talk to my instructor about my research project for the electron microprobe class. While looking at the different specimens, like the pallasite pictured above, I had a revelation of sorts: I was looking at pieces of planetismals and failed proto-planets. And some of these pieces are as old as the solar system itself. Each meteorite tells us something different. It’s composition gives us an idea of where it came from and under what conditions it formed. 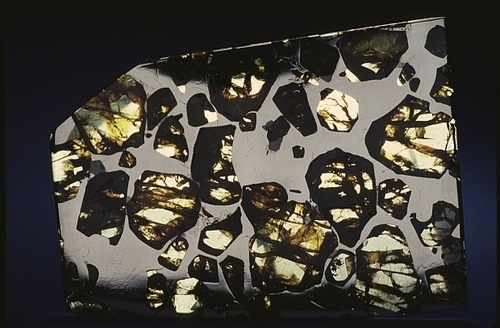 Take the pallasite for example. It’s composed of large crystals of olivine embedded in an iron-nickel matrix, or body. It is thought that these types of meteorites originated at the border between the mantle and the core. Normally, you wouldn’t find olivine floating around in the core. However, something had to hit and obliterate this young planet to cause such mixing. The earth has the same type of iron-nickel core with an olivine (and other minerals) producing mantle. Finding space debris like the pallasite furthers our understanding of our home planet. Excuse the hyperbole, but I think that’s awesome. To look at and study a piece of a failed planet is awe-inspiring and humbling. It furthers my love of science and motivates me to learn more about the world around me. Most importantly, doing science is fun. The learning process is exciting and it never ends. And I hope to be able to spread that enthusiasm to others.